At NPS 2018 earlier this year, we got to put our hands on the new Milwaukee Stud Tape Measure for the first time. What’s Milwaukee doing differently this time around to warrant a new name for their tape measures? This is the tape for Pros that are looking for the best top to bottom durability in a tape measure. The only thing lacking is double-sided printing, so take that into consideration if you read the reverse side of the blade frequently. The big deal surrounding the Stud is all about the blade. According to Brandon Miller, Director of Product Marketing for Milwaukee, their team identified tape tear as a common failure point. Using the name EXO360 for the upgraded blade, Milwaukee Stud tape measures wrap their nylon coating 360° around the blade. The result is a blade that Milwaukee claims is rip and tear resistant with 10 times the abrasion resistance of their current tape measures. Some of the other features we’ve seen before from Milwaukee include their 5-point reinforced frame, impact resistant overmold, and 10′ standout. Milwaukee tells us that this tape can survive an 80′ drop onto packed soil. Expect the new tapes to run $19.99 for a 16′ and $24.99 for a 25′ – pricing that’s in line with their typical premium tape launches. I ran through our standard throw and standout tests. The best throw I sent out was right at 123 inches. That actually matches Milwaukee’s mark in our shootout using the 48-22-7125 that was beaten only by Klein. For standout, I came short of the 10 feet Milwaukee claims by just 5 inches. Both exceed our 8-foot baseline expectations easily. 115 inches tops the 7125 by an extra 10 inches and is perfectly acceptable at the Pro level, though it is middle of the pack. The Milwaukee Stud uses nice bold number markings along with fairly standard increment marks between whole inches. It’s just single-side printing and there aren’t any bonuses like blueprint scales, though you get your stud and truss indicators. The accuracy measures perfectly at the 6-inch mark on our Lixer Master tape measure calibration tool. The hook is fairly minimal, even for Milwaukee. The meat of it is on the bottom, so you’ll get excellent hooking from the bottom and both of its corners. Hooking from the top and top corners is pretty much non-existent. That’s not a huge detraction since there are no reverse side markings to read if you do. Milwaukee sticks with their standard wire clip. That can be a hit or miss move, but it’s stronger than it looks. It secures with just a single screw that holds with surprising strength. I have medium size hands and the Stub is a little larger than I prefer. However, the overall footprint forms into your hand well and the Finger Stop and lock are both easy to operate with one hand. The test Milwaukee showed us at NPS 2018 involves folding over the tape and stepping on it, so I repeated it and took things a little deeper. Bending and stepping on even a premium blade like what Milwaukee puts on the 7125 is pretty much a death sentence. 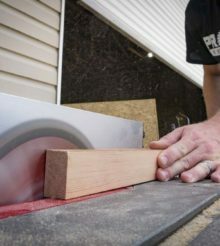 Even though it doesn’t fully separate, these blades crack and you can finish them off with just a quick bend or two. When I tried the same thing with the Milwaukee Stud, it bent but didn’t crack. I was able to bend it back into a useable form and continue making measurements without an issue. But a bend in the blade is still damage and I set to work out if I could break it from there. I take some back and forth bending work, but the blade will eventually crack and break. Still, the claim that it’s 10 times tougher seems pretty accurate with this level of abuse. There’s little doubt that the Milwaukee Stud has the toughest blade out there right now. The rest of the design is in line with the durability of their other tapes, so I don’t have any concerns about its ability to stand up. At $25, it’s in the premium tape measure class, and I’d like to have a more substantial hook and reverse side markings to make this a go-to tape measure for every situation. As it stands, it’s a great tape and an easy choice for any Pro who doesn’t rely on double-side printing frequently. I’ve been a Stanley man for 40 years. I don’t care for the Fat max versions. I thought I would try The Milwaukee stud. It is huge. I’m not thrilled with the size of the case. Totally unnecessary, the Stanley tapes in the regular size cases are really big enough. I’ll use it and see about the durability. I can always be swayed. I was a tester for Rigid and always gave a fair assessment. All the cheap knock off brands including Craftsman are awful. I hope it’s better than their other tapes.